We are a Kohl's family. We go there all the time for M's clothes, kid clothes, toys, house stuff. You name it, we can probably find it there and have a blast in the meantime. I didn't need any help to love Kohl's more, but they've gone and done something extra special anyway. They've come up with a neat way to get kids reading this summer. 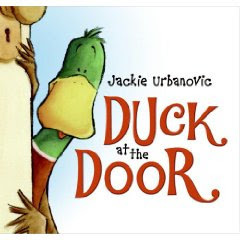 As part of the Kohl's Cares for Kids program, until the end of June you'll find two awesome books by Jackie Urbanovic (New York Times best-selling author and illustrator!) for sale along with their coordinating plus toys for just $5 each. Duck Soup and Duck at the Door are hilarious books that you and your kids will get a kick out of reading. The coordinating plush toys are really high quality and surprisingly funny and cute. For just $5 you can get a fun treat, or a nice birthday present for a friend. You and your child could pick out a couple gifts for less fortunate or hospitalized kids, you could even start a pint sized book club for your child's friends! When the price is right and the money goes towards charity it's hard to resist! 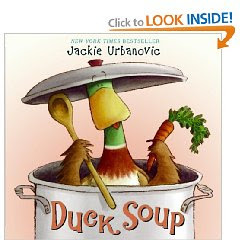 - Jackie Urbanivic's Duck books have adorable whimsical pictures that will delight even the youngest children and great lessons about caring for others that will interest older ones. - The stuffed animals are wonderful quality toys - incredibly soft with the greatest facial expressions. - $5 for a book or a stuffy! Can't beat that! - Helping others by getting yourself a treat! Even better. - You people are going to stop believing me, but what can I say, I can't think of any negatives here. 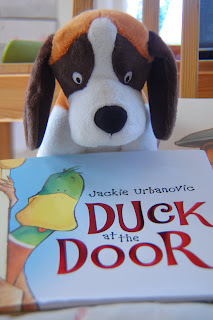 Win your very own Duck book and coordinating plush toy! 1) Leave a comment telling me about something charitable you and your child have done. 2) Leave a comment telling me how you are going to get your child to read this summer. 3) Visit the Kohl's website and tell me about something you just have to get. Giveaway ends Sunday, June 7, 2009 at 10pm PST. This giveaway is now closed. Please visit my other giveaway for more great prizes! I received two Duck books by Jackie Urbanovic and two plush coordinating toys for review, but I was in other no way compensated for this giveaway. All opinions included in this post are mine and mine alone. *Through the Kohl’s Cares for Kids program, 100 percent of the net profits from sales of the Duck books and plush toys will benefit children’s health and education initiatives nationwide. 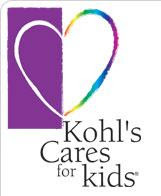 Since the Kohl’s Cares for Kids program’s inception in 2000, Kohl’s has turned $5 merchandise into more than $126 million that has made a positive impact on the lives of children across the country.